One of the brightest looking birds and a birder's favourite on South India's menu, the Black-and-Orange flycatcher is a hill forest species. It is classified as 'Near-threatened' on the IUCN owing to habitat loss. The Broad-tailed Grassbird is an Old World warbler that inhabits high altitude grasslands (Sholas), and is classified as 'Vulnerable' on the IUCN due to habitat loss. Split recently from the Pompadour Green Pigeon species complex, the Grey-fronted Green Pigeon is famous for its melodious whistles that resonate through the forests of Southern India. The Malabar Woodshrike is often spotted in moist lowland forests and specializes in hunting tree insects. A delightful backyard bird all along the Western Ghats, the White-cheeked Barbet gives itself away easily by its characteristic 'kutroo-kutroo' call. 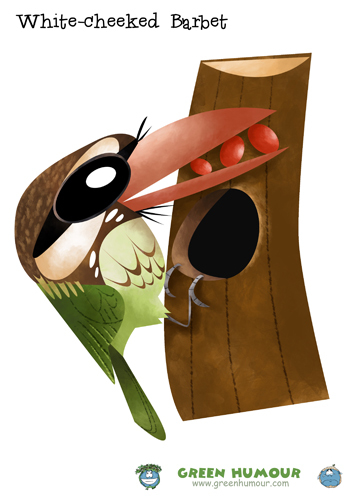 It is a strongly arboreal frugivore. Recently split from the Crimson-fronted Barbet, the Malabar Barbet is often seen in forests around coffee estates. It is primarily a fruit eater. Split recently from the Chestnut-tailed Starling, the Malabar Starling is associated with hill forests around the Ghats and is often found near fruit trees in large congregations. 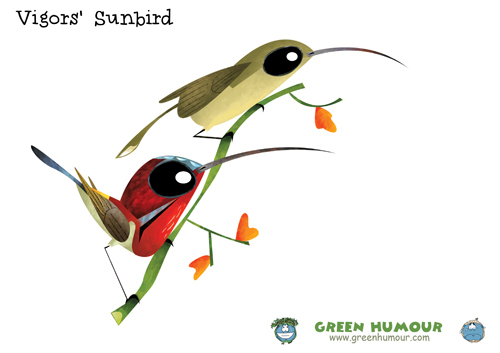 One of the two species of sunbirds endemic to the Western Ghats, the male is characterized by an iridescent velvety-red on the mantle, while the female is drab green with a red rump. A forest dependent fruit and insect eater, and my favourite Nilgiri endemic! A resident of moist, broad-leaved evergreen forests, classified as Near-threatened due to habitat loss. Told apart from other hornbills of the sub-continent by the lack of a casque. Their loud cackling voice makes them a delight to listen to. 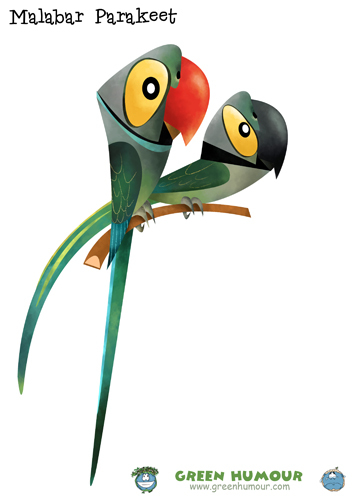 Also known as the Blue-winged Parakeet, the male sport a bright red bill, while that of the female is black. The species is threatened by the pet trade. Classified as 'Endangered' on IUCN's Red List due to habitat loss, the NIlgiri Blue Robin or the Nilgiri Shortwing is also a resident of the Sholas, an extremely restricted montane grassland habitat. A familiar sight along coffee plantations and tea gardens, Rufous Babblers can be seen foraging in noisy groups. One of the tiniest birds in India, the Nilgiri Flowerpecker specializes in feeding on fruits and nectar and is hence an important seed disperser and pollinator. 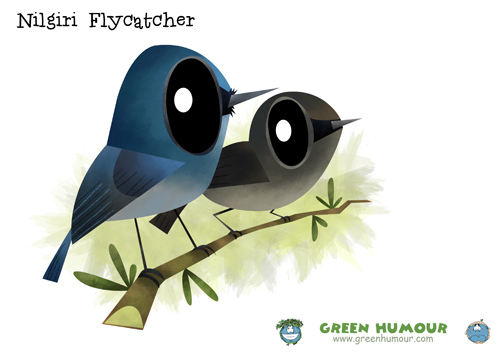 'Near-threatened' owing to habitat loss, Nilgiri Flycatchers are tiny insectivores, often also referred to as Nilgiri Verditers because of their resemblance with the Verditer Flycatcher. They are usually seen on the higher altitudes of the Nilgiris. Classified as Endangered because of deforestation and habitat loss, the Nilgiri Laughingthrush occurs North of the Palghat Gap and gets its name from its laughter like call comprised of loud ascending and descending nasal notes. 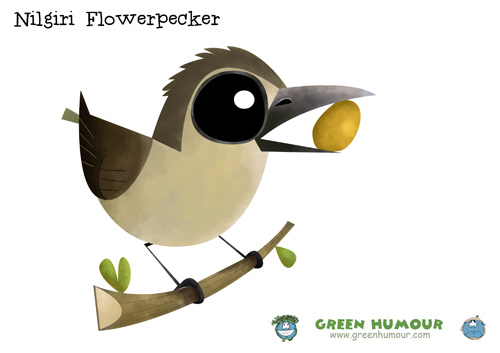 Also referred to as the Kerala Laughingthrush, it is found in Palni Hills, the Annamalais and Munnar. The third Bulbul endemic to the region, and also the rarest, the Yellow-throated Bulbul is retricted to scrub habitats along rocky slopes. Its habitat is severely threatened by granite quarrying. A beautiful bird from the crow family that is endemic to this region. It is a mixed-species flock specialist and is often spotted in association with Greater Racket-tailed Drongos. 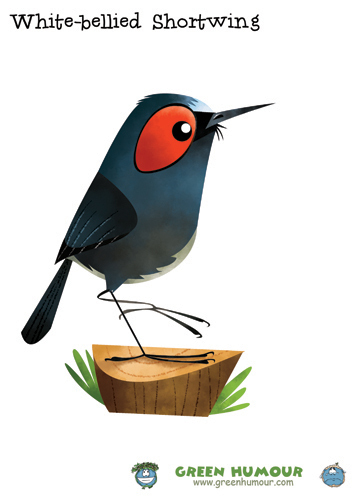 Also called the White-bellied Blue Robin, it is endangered because of habitat loss. 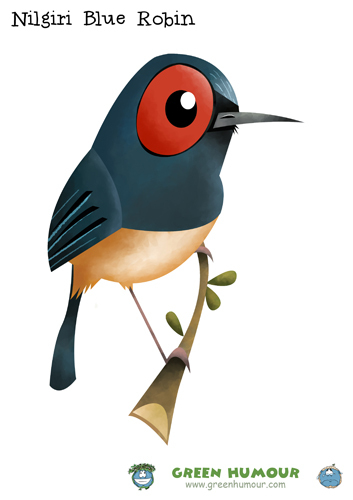 Like the Nilgiri Blue Robin, it is also a resident of the Sholas. 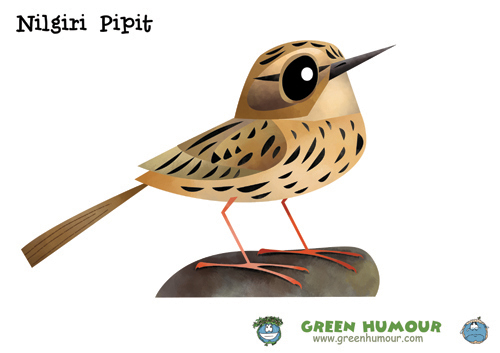 The Nilgiri Pipit is endemic to high altitude grasslands in the region, and is richer brown in colour than other pipits found here. The heavily streaked crown and upperparts are added pointers to its identification. It is classified as 'Vulnerable' on the IUCN owing to habitat loss. 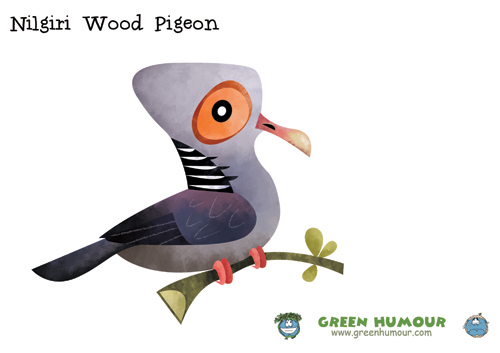 The wood pigeon is a frugivorous canopy-dweller. The checkerboard pattern on the nape is a characteristic feature. It is classified as 'Vulnerable' on the IUCN Red List due to habitat loss. Split recently from the Scaly Thrush, the Nilgiri Thrush is a shy resident of hill forests. 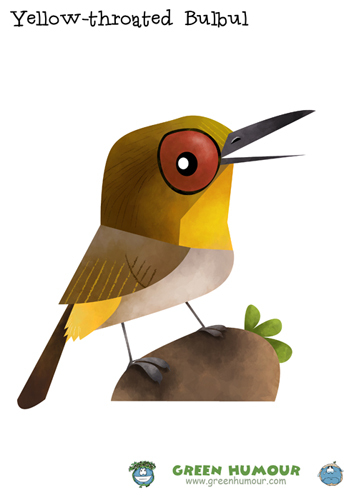 It hunts insects and grubs on the forest floor and is very difficult to spot as it prefers dense cover. The male White-bellied Blue Flycatcher is exactly what the name is, while the female sports a bright rufous breast and is brown behind. They prefer damp spots in dense hill forest. The broad, black mask contrasting with the white throat are characteristic of the Wynaad Laughingthrush. 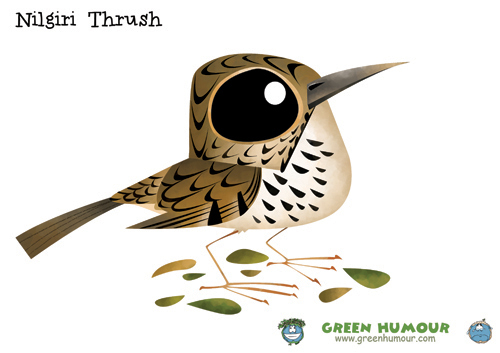 It has a wider range than that of the other two endemic laughingthrushes, but is still a skulker of the undergrowth and hence difficult for the twitcher to spot! 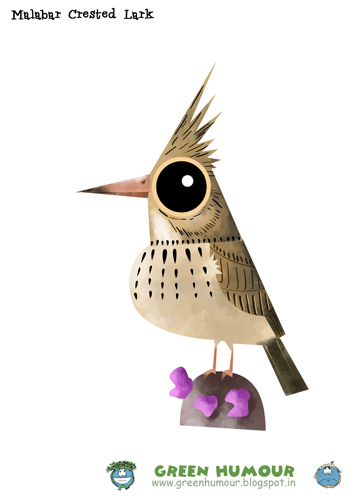 A resident of high altitude scrubs, the Malabar Lark is characterized by a long, spiked crest and is an insect-eater. 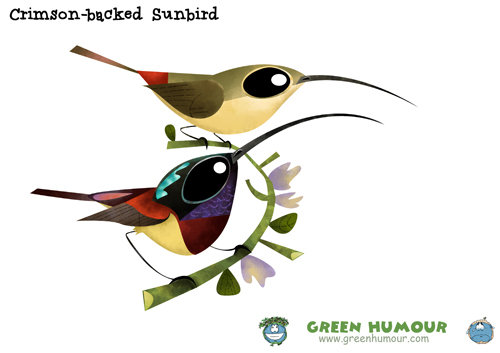 Split recently from the Crimson Sunbird, the Vigors' Sunbird is a sparkling endemic. The male is bright red with a yellow back and a bottle-green tail, while the female is dull green. The species is named after the zoologist NA Vigors. The orders can be placed by e-mailing me on rohanchakcartoonist@gmail.com (Please don't forget to mention your complete postal address and contact number). White-cheeked barbets are found in good numbers in Bengaluru. They are pretty common even in urban areas. Of course. Have spent four years in Bangalore and have met the barbets of the city as well the wood pigeons of Nandi. I meant to include areas adjacent to the Ghats as well in the endemic bracket. You are amazing :) extremely! Thank you Kiran and Aditya. 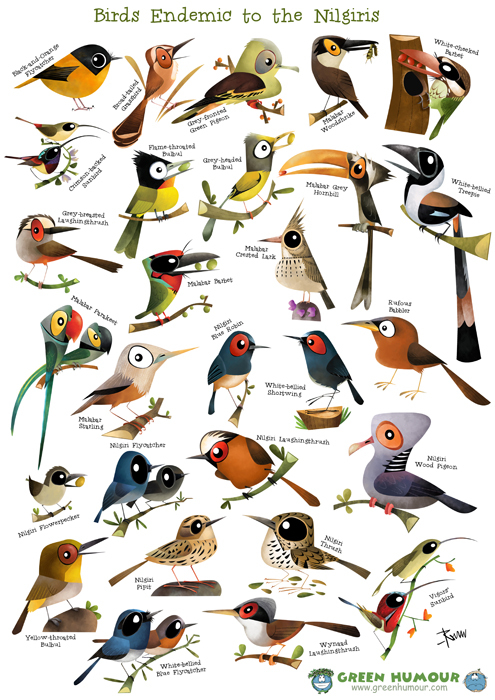 @Aditya- This poster includes birds exclusive to the Ghats. 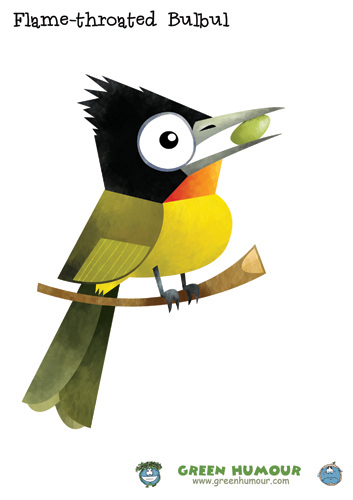 Have left out the ones whose ranges extend to Sri Lanka, like the Square-tailed Bulbul and the Malabar Trogon.